The rampant typography leaves no doubt that this is the handiwork of the now-famous street artist Ben Eine. This presumably commissioned piece has, in truth, been sitting around on Middlesex Street for a few weeks, but the artist returned today to finish off the job. Can you read a hidden message? 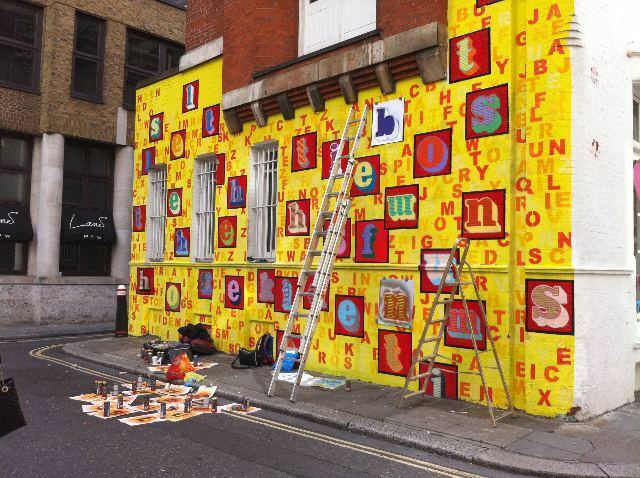 Eine is most famous for painting giant letters onto shop shutters, a trick he's been doing for years, which recently reached a crescendo further down Middlesex Street where he painted a full alphabet of letters across shop fronts. He then gained international attention in July when David Cameron presented a piece of Eine's work to President Obama. This latest dose of alphabet replaces a skilfully painted yet somehow lifeless mural that's adorned the wall for over a year.